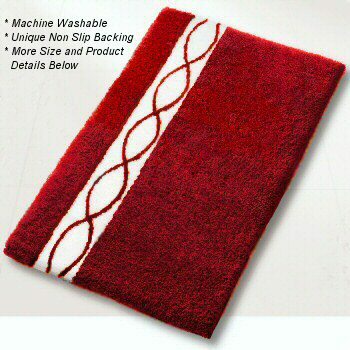 Plush classically designed bathroom rug with a high quality, dense, soft high pile 25mm / .98in. Garnet Red: Deep beautiful jewel toned garnet red with a snow white inset design running the length of the rug with twisted garnet red lines. Coordinated Lid Cover: Solid Garnet Red. Elongated lid covers for the Classico design are solid colors and are coordinated as stated above in the color descriptions.